Gears are quite printable. As such, they’re a favorite of 3D printers to produce. 3D printers can output very complex and unique gears that would cost laughable amounts to produce with casting. So Thingiverse is filled with gears. Besides all the gears for various 3D printers, there are planetary gears, nautilus gears, heart gears, and cube gears. 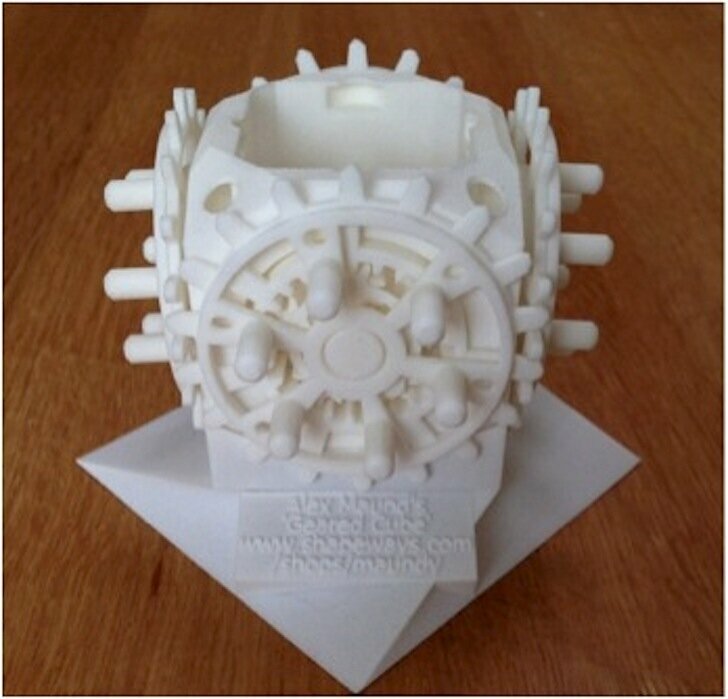 There are also gears on Shapeways, and Alexander Maund designed a doozy of a gear set called Steampunk Geared Cube. This cube has 28 gears that all interconnect; if you spin one, they all spin. There’s also a compartment in the cube that can store tiny keepsakes. It has a lid too, and it’s locked and released by turning the gears. Maundy (his user name) says “Interchangeable mechanical add-ons may be designed in the future that can be put in place of this lid and driven by the rest of the cogs.” Neat. If you’d like one, Shapeways will print it for you for $89.63.